The High Court decision that offshore processing is lawful has triggered a wave of protest, from the churches to the Labor Party. 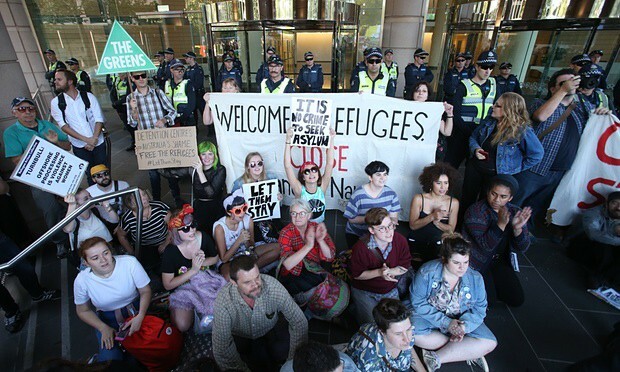 If we can harness the opposition, we can win the demand to let them stay and build the movement against offshore processing and mandatory detention. The pressure to keep the 267 is growing. Tens of thousands have demonstrated and signed petitions. Churches are offering sanctuary; The Age has again editorialised against offshore processing. The letter from Victorian Premier Daniel Andrews to Prime Minister Malcolm Turnbull is a political turning point. The Australian Education Union (AEU) that represents teachers in Victoria has solidly backed Andrews’ call for the 267 to be allowed to stay. NSW nurses have added their voice. Andrews’ offer has turned up the heat on Turnbull. With three Labor state premiers calling for no removals to Nauru, it has also put the heat on federal Labor. But Bill Shorten still says federal Labor supports offshore processing. Andrews and the state premiers need to go one step further and declare they will not cooperate with any removal. We need to step up the pressure to make the returns politically impossible for Turnbull. Socialists have long argued that a mass campaign of meetings, rallies and grassroots organising can raise awareness, shift public opinion and build the forces to change policy. The current shift is a small vindication of this. Thousands of people understand the horror of offshore processing. We can now see just how wrong were those like Robert Manne who argued for the movement to go quiet, accept that Abbott had stopped the boats and accept the bi-partisan support for offshore processing. We have also argued to maintain a focus on the union movement to mobilise organised workers in support of refugees and to break the Labor leaders’ support for turnbacks and offshore processing. A serious fight between Labor and Liberal; even open dissent inside the Labor Party, would help shatter the illusion that the issue is settled and nothing can be done. It was the mass movement under Howard last time that shifted public opinion, and pushed Labor to promise to provide permanent, not temporary, protection and close Nauru when it came to power. This pressure will be strongest if it comes from inside the unions – Labor’s support base. Last year we saw fantastic demonstrations by doctors and health professionals against the Border Force Act and children in detention. Teachers also gathered at work on Human Rights Day in December to take photos under the slogan ‘Fund Education, Not Detention’. We need more resolutions from the unions and workplaces to draw wider layers into the rebellion against Turnbull, and pressure Shorten. Everybody coming to the demonstrations can be involved in the campaign, and help build locally for the Palm Sunday rallies. The ground is shifting but the government is still saying that some will be sent back to Nauru. Future legal challenges may delay them. But we need everyone on alert to mobilise outside the courts, and at the detention centres and the airport if necessary. The government’s brutal anti-refugee policy is part and parcel of a suite of government policies that are built on racism, fear and scapegoating. The government attempts to make a false link between refugees and terrorism. Refugees are used to whip up Islamophobia and are used as scapegoats for the government’s failure to provide jobs, or fund housing and health care. The government is talking about raising the GST and making cuts to spending on health and education, but wastes billions on detention. Many people have accepted the lies that refugees are simply coming for a ‘better life’ and are rorting the system. But we know who is rorting the system: Turnbull pays Transfield/Broadspectrum $2.2 billion dollars to run the offshore detention centres. They let big business get away with avoiding tax. Socialists argue the two fights must go hand in hand: we have to build the case for welcoming refugees – at the same time, we need rallies aimed squarely at the government for funding for education, health, no GST increase, save penalty rates, tax the rich. We need to fight their system of crisis and war that creates poverty and inequality, and that creates refugees. Join us and stay in touch with Solidarity to help build the refugee movement and the fight against the system.